Thanksgiving is almost here! Soon, the family will be arriving for the big Thanksgiving dinner and subsequent football game or Christmas movies. In the meantime, you’re probably planning the menu and getting the house ready for the mass of well-loved guests. It’s best to use all the help you can get, and that might include your aluminium deck. With warmer Texas weather, November doesn’t necessarily mean staying inside all day, and your deck may come in handy more than you realize. How big are your Thanksgiving celebrations, usually? If it’s just a few close family members, you may be fine sticking to your indoor space. However, if it’s a few close family members and their kids, your cousin’s new boyfriend, your best friends and their kids, and the neighbor or coworker who didn’t have anything else to do for Thanksgiving…you need more space. With a good aluminium deck, the party can spill out into your outdoor space. By opening up the deck to guests, everyone can move around freely, most of all you while you corral your kids and get the food ready for the main event. On the other hand, if you have a smaller group, maybe you want to mix up the conventional Thanksgiving traditions. If it’s a nice day, you can bring a table out to the deck and let everyone eat outside. After, the kids can play on the lawn or you can play a loose backyard game of football. It’s easy to remember what to be thankful for when breathing in the fresh outside air, surrounded by the beauty of autumn and the people you love best. 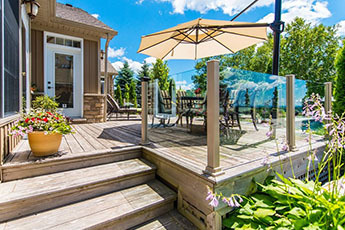 And with aluminium deck railing surrounding your deck, you can be sure that your kids will be safe. The holidays are the best time of year to decorate the house, and many homeowners start with their porch or deck. You can find some rustic, harvest themed decorations like hay bales, corn stalks, scare crows, or large cornucopias. On the other hand, you could wrap the railing in lights and get a jump start on your Christmas decorations. Your deck offers plenty of space to decorate in whatever way your heart desires, and it will help get your friends and family excited about the holidays as well. Your aluminium deck could be just what you need to keep the holiday parties going this year, whether Thanksgiving or something closer to Christmas. Don’t have an aluminium deck? Contact Sunspace Texas for a free quote today on our high quality, maintenance free aluminium decks.